For me, a huge part of the allure of travel is the food—the opportunity to explore new food cultures, to try new things, to seek out the birthplace of foods I already know and love. Which is why you’ll often find me planning trips with a specific foodie goal in mind: to visit the top restaurant in the world or to seek out the best pizza in Naples (where pizza was invented), to visit Zimbabwe’s Boma restaurant for ostrich kabobs or to try rustic rosti in the Swiss Alps. Like many food-lovers, one of my favourite places to eat is Italy—home of authentic balsamic vinegar, rich homemade olive oils, tangy Parmigianino cheese, rich lasagna, creamy buffalo mozzarella and, of course, the original pizza. I’ve taken two pasta-making classes in Rome and both were a delight. I’ve always wanted to know how to make authentic pasta at home and, after a couple classes, I finally feel capable of trying on my own. For a private class—perfect for those with a shy disposition or foodies who know they’ll have a thousand questions for their teacher—try Ristomama. You’ll be paired with a real Italian mama for a lesson that includes not only the pasta itself, but sauces, fillings and general cooking tips. For a group class—perfect for those who love get-togethers and prefer a simple single-pasta menu for their first attempt—Walks of Italy’s pasta-making class is a riot of humour, tips and hands-on experience. For those visiting Rome in the European winter months, one of the most celebrated seasonal cuisines is the artichoke. You’ll see their spiky leaves poking up from fresh markets all over the city and find them listed on menus pretty much everywhere. The Roman style is boiled and soft with herbs and sometimes a rich creamy sauce. The Jewish-style is fried crispy and tastes a bit like potato chips. My favorite place for both styles is a little restaurant in the Jewish Quarter called Ba’Ghetto. If you’ve come to the city to eat, taking a food tour early in your trip is a great idea for several reasons. Firstly, of course, it’s delicious. You’ll get to try a lot of different local goodies—all with a running commentary from your guide about food history, production and connection to the local community. Second, food tours introduce you to places you’ll probably want to circle back to. Falling in love with a bakery or sausage shop or pizzeria on day one of your trip means you know where to go on day two when you’re desperately craving a great croissant or a slice of pizza. 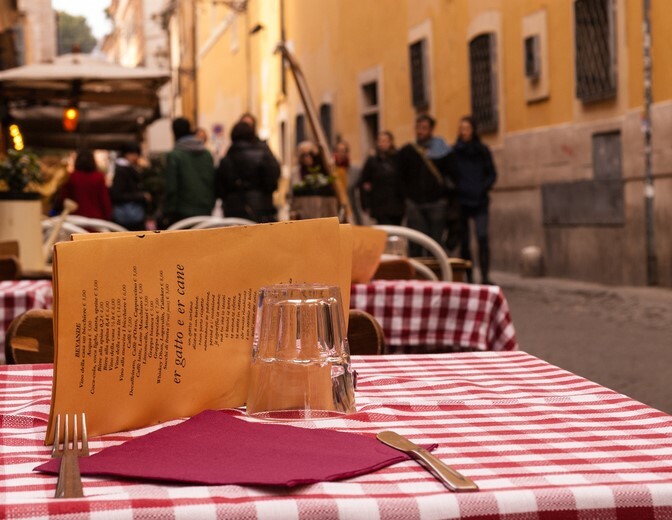 I’ve taken several food tours in Rome and the best of the bunch was The Roman Food Tour that winds its way through the lesser-known Prati neighbourhood. I’ve eaten a lot of gelato over the years—both in Italy (its birthplace) and around the world—and the absolute best, most authentic, artisanal experience I’ve ever had was at Gelateria del Teatro right here in Rome. The shop has three locations and the original—near Piazza Navona—is particularly charming. For the adventurous among us, seasonal artisanal flavors include lavender peach, pumpkin, white chocolate basil, and—a personal favourite—a wonderfully creamy raspberry sage. For those craving more traditional flavours, the truffle chocolate, summery strawberry and light crème brulee will see you returning again and again. Don’t miss Giselda in Trastevere. Grab a number as you walk in the door and head to the bread counter at the back of the shop. Shoulder to shoulder with locals grabbing their daily bread, order yourself some focaccia (just point at it and say ‘cuesta’, which means ‘this’), which can be cut to whatever size you like, for a snack, a lunchtime picnic or a side with your dinner. The bread is always cloud-soft with the perfect blend of salt, olive oil and herb. I eat it by the kilo, mostly on its own and occasionally dipped in a tomato sauce or lightly layered with truffle spread. Sign up here for IL Australia’s e-letter and we’ll send you five free postcard e-letters weekly. We’ll also send you a FREE research report on Italy: Europe’s Most Seductive Country.